A super-villain's staying power is inversely proportionate to the amount of smack-talking he does on the cover. The exception, of course, is Dr. Doom, who can't go five minutes without reminding us how awesome he is and then using his time machine to go fight King Arthur or something. Most of the time, though, it works out, as evidenced by the fact that there aren't a whole lot of major Prester John appearances. 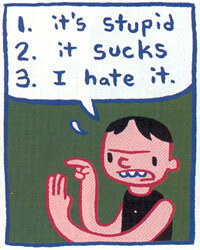 Case in point: Master of Kung Fu #37. Feast your eyes, gentle reader, on DARKSTRIDER AND HIS WARLORDS OF THE WEB! 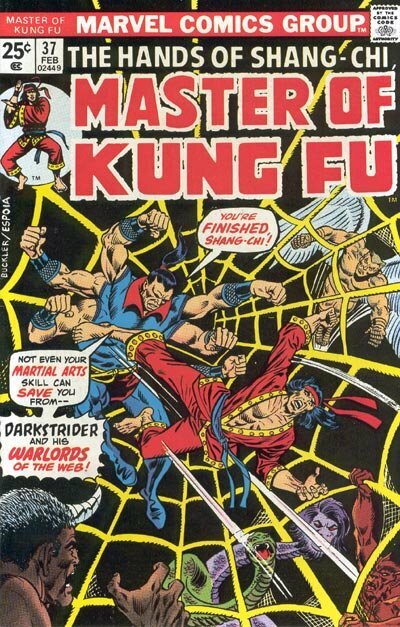 That is a dude with six arms--complete with henchcentaur--standing in a giant spider-web beating up the Master of Kung Fu, and in theory, that is awesome. In practice? Eh, not so much. Not that there's anything wrong with the story itself. Coming from Doug Moench and Keith Pollard, "Web of Dark Death" is perfectly serviceable. Especially considering that it opens up with Shang Chi beating the crap out of a bunch of ninjas on top of a moving train. And yes: There is breakdance fighting. 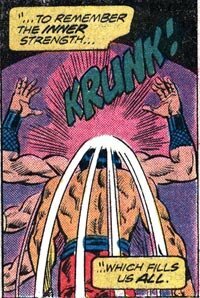 When you have utter mastery of unarmed combat, that sort of thing seems to happen pretty much all the time, but after the ninjas--who, it turns out, are the sinister Warlords of the Web--vanish into the night, Shang goes back to hanging out with a traveling freakshow. Why exactly he's palling around with a gang of good-natured performing Mutants™, I'm not quite sure, but considering that said freakshow includes a centaur who is also a unicorn, I think we're all a little better off not knowing. Anyway, conversation eventually rolls around to the reason that these guys are currently dealing with a ninja problem, and as it turns out, it's all Darkstrider's fault. But when Shang Chi actually tries to find out just what that guy's deal is, everyone tells him a different story that revolves around how he's some kind of animal who has taken human form in order to get revenge. It's exactly like Rashomon, if Rashomon was really, really boring. 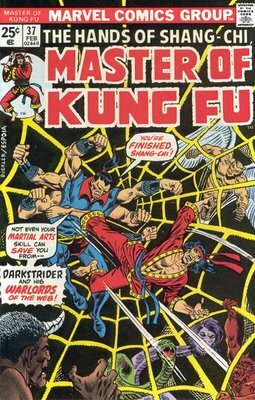 Finally, seventeen pages into the story--six of which are taken up with conflicting flashbacks--Darkstrider finally shows up with his huge spider-web, captures the freaks, and challenges Shang Chi, The Master of Kung Fu, to a fight. And, well, that works out about like you'd expect, really. 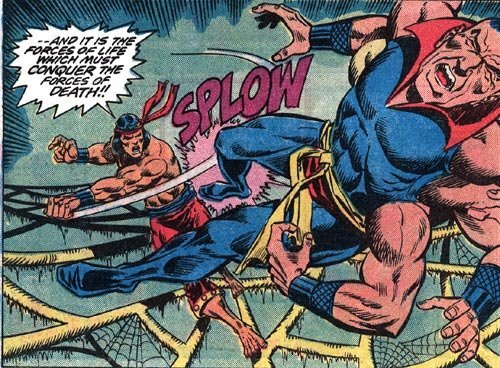 And that, as far as I can tell, is the end of Darkstrider (who may in fact be death itself), seeing as Shang Chi hits him so hard that he crumbles into dust. 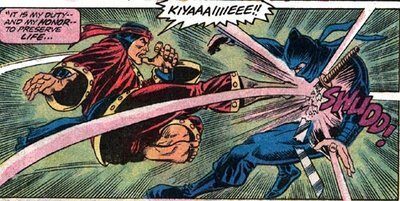 Really, though, Shang Chi once punched someone so hard that he ended up working for Batroc Ze Leaper for the rest of his career, so getting chin-checked into a fine powdery substance is probably just his way of letting you off with a warning. I would have gone with "SPLOW, How you like me now? Mama said knock you out." But that's just me. My girlfriend's a black belt in kung fu. Masters of the Web? I'm sure in the 70s that sounded vaguely menacing, but these days all I can think of is that they strike fear into men's hearts by banning them from online forums and bombarding them with spam e-mail. Warlords of the Web, even. I r good at teh reading. 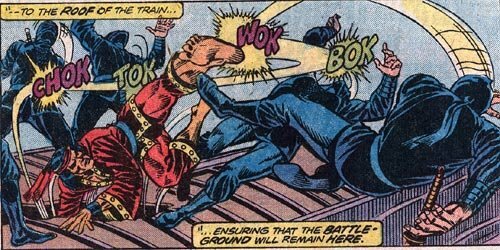 Shang-Chi is always good for ludicrous villains in ludicrous settings getting kicked in the face a ludicrous amount. They aren't major appearances, but Prester John shows up in every other issue of Cable/Deadpool. 'Pool even finally made the obvious jokes about his rod. As awesome as most of Shang-Chi's Bronze Age-baddies were, I still give the edge to Luke Cage. If only for the fact some of his more radical badguys actually reappear later on (Shades and Comanche, Piranha Jones and Cockroach Hamilton, Mace, etc). You have to love Marvel's Bronze Age. You just have to. Chris, I think I'll stick with the midget burglers. Hmmm... and for some reason back then I always felt Shang-Chi was the more "serious" counterpart to the Iron Fist comic. One foot, one kick, four chins, four different sounds, no exclamation marks. This is why they call him the master of kung fu. KUNG FU II: ELECTRIC BOOGALOO!! So badass that he takes out the villain with a headbutt while wearing a bridal veil. Check out that "krunk" panel again. The Random Panels Suicide Squad Meme!